When you’re looking for a quick and satisfying pick-me-up, you want more than empty calories. You grab a snack bar, the hybrid between a cookie and a candy bar. But is it really any better for you? The answer is a qualified yes: some (but not all) are great alternatives that can make a positive contribution to your daily nutrition. Most people can enjoy a tasty 225-calorie snack without tipping the calorie scale, especially if the bar is made of wholesome ingredients, such as whole grains, nuts and dried fruit. • at least 3 grams of fiber. Label scrutiny is essential; many bars are high in calories—those labeled as “energy bars” are better suited for sustenance on a hike rather than a snack at your desk, even if the ingredients are wholesome. And others, usually those labeled “high protein,” are also chock-full of calories and saturated fat with little or no fiber. The ingredient lists are often similar to those of candy bars: plenty of corn syrup, sugars and partially hydrogenated oils. Lastly, steer clear of meal-replacement bars for specific weight-loss plans; these expensive concoctions often taste terrible and are surprisingly high in calories, while including undesirable ingredients and questionable health and diet claims. What Snickers and Hershey bars did for past generations, snack bars are doing today. They’re trailside pick-me-ups, pre-exercise energy boosters, afternoon snacks. Consumers assume they are getting better forms of energy than those delivered by mere candy, but with all the new bars crowding the supermarket, it’s hard to know which ones are healthy and worth the calories. We set out to find a nutritionally sound snack bar that tasted great. We chose bars with a specific nutrient profile: 225 calories or less, less than 3 grams saturated fat and (for satiety) at least 5 grams of protein and 3 grams of fiber. We then did a blind tasting with a diverse panel that included two active teenagers who often eat bars while participating in sports and a fly-fishing guide who will take three or four bars on a trip for lunch. As we all discovered, it pays to read the label when buying any sort of snack bar. One taster reported that she used to eat power bars as a meal replacement, until she realized that the right sandwich could be lower in calories—and more satisfying. Earning praise for its taste, appearance and texture, this rich and spicy alternative is marketed toward the female slice of the power-bar-purchasing pie. Robert noted its “moist texture and spicy flavor,” while Elizabeth loved “the frosting-like bottom and texture.” Cully thought the flavor was a bit too spicy, while Nathan thought the Chai spice was “authentic.” Maria frowned at its aftertaste. 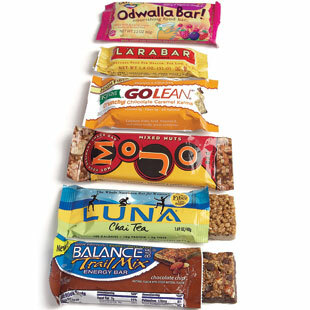 This lower-calorie and low-fat bar also drew rave reviews from our tasting panel. Robert enjoyed its “subtle suggestion of caramel and warm amber color.” Nathan thought it looked great but likened the taste to Rice Krispies snacks he once made in kindergarten. Cully thought it would be better without popcorn in it. Clif Bar developed the Mojo line for “people on the move who want something salty when sweet just won’t cut it.” Elizabeth cited this as her favorite for that very same reason: “it’s not too sweet—like a salty Rice Krispies treat!” Stephanie liked the nuts and pretzels but wasn’t sure how filling it would be. Maria and Cully thought it had too many nuts.